If you need to have dental work completed, we recommend visiting a sedation dentist. At South Florida Smile Spa, Nicole M. Berger, DDS , we offer sedation dentistry for patients living in and around the Pompano Beach area. We understand that for millions of adults, visiting the dentist can be an overwhelming or frightening experience due to dental anxiety. This common condition typically starts by a negative experience or becoming fearful of the general idea of dentistry. While common, you do not have to be concerned about visiting our dentist office because we can ensure your comfort the entire time. When you schedule an appointment with us, let us know if you have dental anxiety so that we can prepare for your visit accordingly. For many people, the actual procedure is not uncomfortable but it is the anxiety and worry that causes angst. With this in mind, we often prescribe an oral sedative or laughing gas that can be administered prior to the appointment to help a person relax. While this is not a pain killer, it eases the fear and relaxes the body so that you can remain peaceful while having teeth cleaned, or dental work performed. While the dosage is different, laughing gas can be used on both children and adults so that all of our Pompano Beach patients can remain comfortable. Sedation DentistryFor many people, dental anxiety is a major reason for not seeking the dental work that they need, in many cases desperately. If you count yourself among the millions of dental phobics in the United States, we certainly understand. Whether you have had a bad dental experience in the past or are simply fearful of the sights, sounds, and sensations associated with dentistry, the practice of Nicole M. Berger, D.D.S., welcomes you. The sedation dentistry options available at our Pompano Beach area office will allow you to undergo multiple dental procedures if necessary, all while feeling no discomfort or anxiety whatsoever. In fact, any memories you have of your dental experience are likely to be highly pleasant. 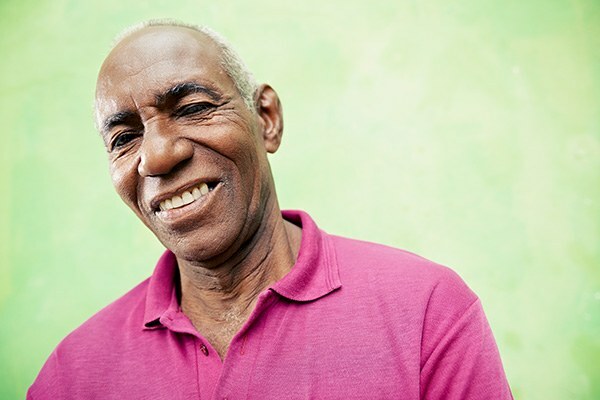 Imagine undergoing years’ worth of complex dental work while feeling completely relaxed. If this sounds too good to be true, we urge you to give us the chance to prove how peaceful a dental appointment can be. Contact or visit our sedation dentistry practice in Pompano Beach, serving Fort Lauderdale and surrounding communities, today. Used to alleviate fear and discomfort during general dentistry, cosmetic dentistry, preventive dentistry and oral surgery procedures, sedation dentistry uses safe medications to soothe patients’ anxieties and make them feel completely at ease. Through drugs administered either orally or through an IV, Dr. Berger can provide just the right amount of relaxation necessary for patients to undergo their dental treatments. Dr. Berger is a certified conscious sedation dentist who will have your best interests at heart while facilitating a comfortable and stress-free dental experience. You can read more on this in the article Dr. Berger wrote HERE, the latest article in Pompano Today, Page 34! If you have avoided going to the dentist due to overwhelming anxiety, sedation dentistry can make your visits more manageable. With the help of sedation techniques, extensive dental procedures can often be performed in a single appointment, without any stress, pain, or discomfort. Patients with sensitive teeth, gums, or gag reflexes or other health issues can also benefit from sedation therapy. Nitrous Oxide sedation, also known as “laughing gas” is commonly used to make treatment more comfortable. This sedation is inhaled through a mask that allows you to breathe in the medication and induces a state of relaxation. Local anesthetic will be administered in conjunction with nitrous oxide to eliminate pain. It is not intended to put you to sleep. You will be able to hear and respond to any requests or directions the dentist may have. The effects of nitrous oxide wear off soon after the mask is removed. Known as “conscious sedation,” IV sedation is a safe and effective treatment for patients with moderate to severe dental anxiety. Certified by the Florida Board of Dental Examiners as a conscious sedation dentist, Dr. Nicole Berger will create a relaxed environment during your procedure. With this type of sedation, Dr. Berger administers a combination of anti-anxiety and pain medications directly into the bloodstream. The sedation and analgesic effect is almost immediate and enables you to remain comfortable and relaxed during your entire dental treatment. This also allows Dr. Berger to combine complex procedures or oral surgeries into a single appointment. During IV sedation, you will remain conscious and responsive to your surroundings. However, yet will be mostly unaware of the dental procedures being administered. If at any time you need more sedation, Dr. Berger can quickly administer more medication, which takes effect more quickly than oral drugs. The overall result is reduced anxiety and reduced discomfort with little or no memory of your treatment afterward. If anxiety over dental procedures is getting in the way of your seeking dental treatment, you may be a candidate for sedation dentistry. 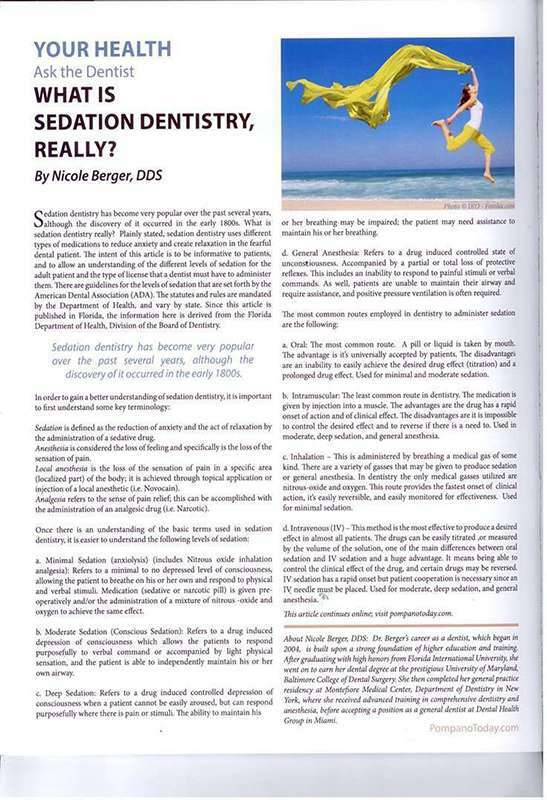 Contact Dr. Nicole M. Berger at her Pompano Beach area dental practice to learn how you can lessen your fear of visiting the dentist through dental sedation. Oral sedation is another method used to achieve “conscious sedation” and can be prescribed for many types of dental work, from a routine check-up to cosmetic procedures. It can also help patients who have a hard-to-control gag reflex or tooth sensitivity, as well as those who are resistant to numbing medications. Depending on your level of stress, Dr. Berger can administer an anti-anxiety pill, or a combination of sedatives on the day of your visit, generally an hour before treatment is scheduled to start (Therefore, it is necessary to have a companion drive to and from the appointment). The sedative will cause a state of complete relaxation, similar to sleep. Although you will not be asleep, you will be mostly unaware of the dental treatments being performed, and will experience an amnesia-like quality that reduces your memory of the treatment. Dr. Berger can then focus on completing one or multiple procedures, potentially reducing the amount of dental visits necessary. Check out what others are saying about our sedation dental services on Yelp: Sedation Dentist Pompano Beach. For those needing oral surgery, total sedation may be necessary or preferable. This is often referred to as sleep dentistry because a patient is put to sleep and will not remember anything from the procedure. As a sedation dentist, we find that this is an excellent solution when a patient is getting a full smile makeover. When the majority of teeth are being worked on, the procedure can take a significant amount of time. We need to do dental work with precision and that requires not rushing through the procedure. With that in mind, our Pompano Beach patients may find it difficult to hold still when the treatment lasts longer than an hour or two. Going to sleep is a much better option because your body will naturally remain still, you will feel comfortable and not remember what took place during the treatment. If this is your preferred method of sedation dentistry, we will monitor you carefully during the treatment and afterwards to ensure that the anesthesia wears off like it should. You will also need to have someone drive you home and may feel slightly sluggish for the remainder of the day. These types of procedures typically call for rest and relaxation anyway, so take it easy at home before resuming normal activity the next day.